Plants produce an amazing diversity of small molecular weight compounds. While the chemical structures of close to 50,000 of them have already been elucidated, the total number of such compounds is probably in the hundreds of thousands to millions. Only a small number of these are part of what have been termed “primary” metabolic pathways; the rest of these molecules are called “secondary” metabolites, also known as specialized metabolites or natural products. The vast majority of these compounds are not found in the standard crop plants of the Western world, nor in standard laboratory model plants such as Arabidopsis thaliana and Medicago trunculata. These compounds are, however, believed to play vital roles in the physiology of the plants that produce them, particularly as elements of the plants’ defensive arsenals. Because of the great diversity of life strategies and accompanying defense strategies, these compounds truly represent the great diversity in the plant kingdom. Yet, very little is known about the mechanisms involved in the formation of almost all plant natural products. Aromatic plants (e.g., sweet basil, turmeric and ginger) present excellent model systems research to identify these mechanisms because i) they synthesize high amounts of specialized compounds, ii) a substantial diversity of compounds can be found in closely related species, and iii) these compounds are often synthesized in specialized structures, such as rhizomes or secretory glands, which makes it possible to investigate the exact role of specific enzymes and genes in the production of specific metabolites in isolation from other major biochemical pathways. We can do this with the glands because these structures (known as the secretory peltate glandular trichomes) can be isolated, intact, from the rest of the plant (as is also the case for the terpenoid-producing glands from mint). Our research seeks to elucidate the biosynthetic pathways that produce novel and important plant specialized metabolites in aromatic plants, to uncover the mechanisms responsible for the evolution of these pathways in the plant kingdom and to understand the function of a given natural product in the biology and physiology of a given plant species. The most productive approach in this area has been a multidisciplinary one-which utilizes the best tools from the fields of chemistry, biochemistry, molecular biology, plant physiology, whole organism biology and ecology-because understanding the role that a specific metabolite plays in the plant requires an understanding of the whole complexity surrounding its formation and utilization. Tools are only now becoming available which allow us to gain this understanding. Besides the intrinsic scientific value of understanding plant metabolism and how plants produce specific natural products, such knowledge is essential for rational custom-designed breeding (by classical methods) of targeted natural product profiles in chemically tailored plants. 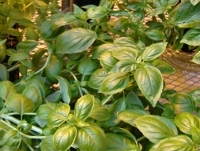 This knowledge is also essential for the application of genetic engineering techniques to improve and develop new aromatic plants. The rhizome is the original stem of the vascular plant lineage. Before plants developed upright stems, they grew horizontally via rhizomes. All extant primitive vascular plants and many advanced angiosperms still use rhizomes as their sole stem type. Rhizomes are responsible for the invasiveness, hardiness, and even harshness of many of the world’s most significant weeds, such as giant Salvinia, bermudagrass, johnsongrass, quack grass, cogon grass, and the horsetail “scouring rush”, to name a few of the most important. The ability of these rhizomatous weedy plants to invade new territory via underground “sneak attack” has led to their great success world-wide, and is directly attributable to their rhizomes. In contrast, many of the world’s most important medicinal plants, such as ginger and turmeric produce their medicinally active components in their rhizomes. Despite their importance, very little is known about what genes are involved in the growth and function of rhizomes. In the LCME we are seeking to identify genes and proteins that are expressed exclusively in the rhizome and to characterize the function of specific genes that play important roles in rhizome function from plants across the plant kingdom.